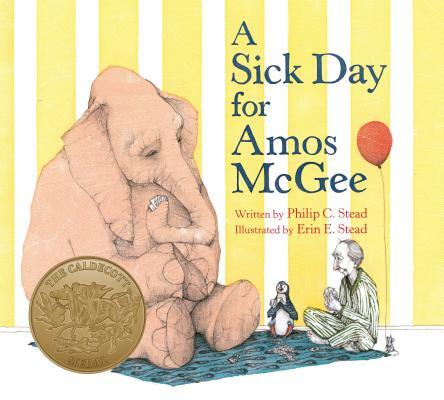 A Sick Day for Amos McGee by Philip C. Stead and Erin E. Stead is a 2011 Bank Street - Best Children's Book of the Year and the winner of the 2011 Caldecott Medal. This title has Common Core connections. PHILIP C. STEAD is the author of the Caldecott Medal winning A Sick Day for Amos McGee, also named a New York Times Best Illustrated Book of 2010 and a Publishers Weekly Best Children’s Book of 2010, illustrated by his wife, Erin E. Stead (A Neal Porter Book, Roaring Brook Press, 2010). Philip, also an artist, both wrote and illustrated his debut Creamed Tuna Fish and Peas on Toast (Roaring Brook Press, 2009), which was applauded by School Library Journal for “its wry humor and illustrations worthy of a Roald Dahl creation.” Philip lives with Erin in Ann Arbor, Michigan. Philip C. Stead and Erin E. Stead are author and illustrator of A Sick Day for Amos McGee, winner of the Caldecott Medal. It is their first book together. Philip is also the author and illustrator of Creamed Tuna Fish and Peas on Toast. They divide their time between Ann Arbor, Michigan, and New York City.